Greetings again from the darkness. It just doesn’t seem very many movies are designed to be funny to a wide range of viewers. There are raunchy comedies for taboo lovers. There are comedies for young kids. There are even Nicolas Cage movies for unintentional laughs. But writer/director Taika Waititi actually delivers a thoroughly entertaining movie that will generate laughs across multiple generations … it’s quite simply, a fun time at the theatre. Based on the 1986 book “Wild Pork and Watercress” by Barry Crump, who himself is a bit of a legendary figure in New Zealand, the film begins with Child Protective Services (or whatever it’s called in New Zealand) dropping off 12 year old Ricky Baker to his new foster family. Paula, the CPS agent, considers Ricky a lost cause and describes him as “a very bad egg” as she rattles off his list of previous rebellions to new foster mom Bella, who takes note of Ricky’s heft with a couple of wisecracks – delivered with a well-meaning smile. In a terrific screen introduction, “Uncle” Hec slowly comes into frame flashing a world class scowl and a wild boar slung over his shoulder. Ricky continues his habit of running away at night, but Bella slowly wins him over with her kindness, understanding and breakfast offerings. A tragic occurrence and fear of being shipped back to the juvenile center, has Ricky disappearing into the New Zealand bush. Soon enough Hec catches up and the two begin a relationship that is the core of the film. Rima Te Wiata plays Bella as a perpetually optimistic woman with a sincere drive to help Ricky adjust and find some joy in life. 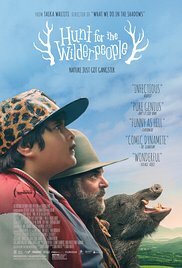 Sam Neill plays Hec in full grumpy curmudgeon mode … a nice compliment to the extraordinary presence of Julian Dennison (Paper Planes) as Ricky. Ricky and Hec together are a hoot to watch. It’s not simply the generational differences, but also a clash of one man who wants little more than to be left alone and a young boy who wants little more than to be noticed and cared about. It’s not so much the direction of their relationship that surprises, but rather the manner in which it develops. Director Waititi’s next film is Thor: Ragnarok, so this makes us appreciate even more his pleasant little indie film that features not just colorful and interesting characters, but the beautiful landscape of the New Zealand bush … much of which we see during the humorous manhunt for Hec and Ricky. It’s a farcical comedy with a dose of profundity and loads of adventure for two social misfits. Rachel House is pretty funny as the obsessed CPS worker, and Rhys Darby (“Flight of the Conchords”) is downright hilarious as Psycho Sam. Watching criminial-wannabe Ricky literally count off his Haiku, leaves little doubt as to why this one has been such an “audience favorite” at multiple film festivals. This entry was posted on Thursday, July 7th, 2016 at 8:54 pm and is filed under Comedy, Drama, World Cinema/Foreign. You can follow any responses to this entry through the RSS 2.0 feed. You can leave a response, or trackback from your own site.